The good thing, they kept saying, was that the Rockies were leading the NL West despite the fact that the bats weren’t doing much. They were right, as Colorado entered this weekend’s three-game series against the Giants ranking in the bottom 10 in baseball in runs per nine innings. In a four-game series in San Francisco last weekend, Colorado picked up three wins off just 14 total runs. The Rockies nearly scored that many in each of their games Saturday and Sunday as they swept the Giants out of Coors Field in hands-down their most-impressive series of the season and best stretch of games in a long while. Coming off the historic series win (it was their first four-game series win, ever, in San Fran), Colorado went to L.A. and split a two-game series in which they faced Hyun-Jin Ryu and Clayton Kershaw. Tyler Anderson nearly matched Kershaw in a 4-2 loss in the second game. Confidence was high heading back to Coors. On Friday night, Tyler Chatwood battled and the offense woke up for a six-run fourth inning to beat Johnny Cueto, 6-5, for the first time in what seems like forever. (It was actually 2012.) The bullpen was nails in the win, as it has been all year. Greg Holland picked up his NL-leading ninth save, setting up a favorable matchup for Saturday. Antonio Senzatela was simply dominant in the middle game, earning his NL leading (tie) third win and moving into the top 10 in ERA and top 5 in WHIP in the league. Colorado’s offense took the next step, putting up three runs in a pair of innings and then exploding for a six-run eighth inning to a 12-3 win. Oh, and the bullpen secured some huge outs in the seventh and eighth innings prior to the Rockies’ offensive explosion. The defense pitched in some key plays for a dominant victory on all four levels. On paper, Sunday could have been interesting. 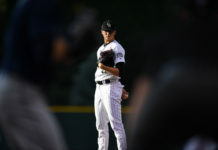 Veteran righty Jeff Samardzija was looking for revenge after a tough loss to the Rockies in his last outing, and Colorado was sending hometown rookie Kyle Freeland to the mound following an uneven pair of performances his last two times out. 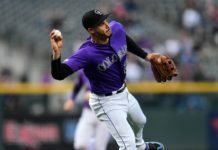 Freeland, however, pitched a gem to match the one he pitched for the Rockies home opener to defeat Clayton Kershaw, allowing just six his (only one extra-base hit) over seven scoreless innings. Colorado’s offense continued to roll, putting up eight runs on the back of a two-hit, three-RBI day from Gerardo Parra. 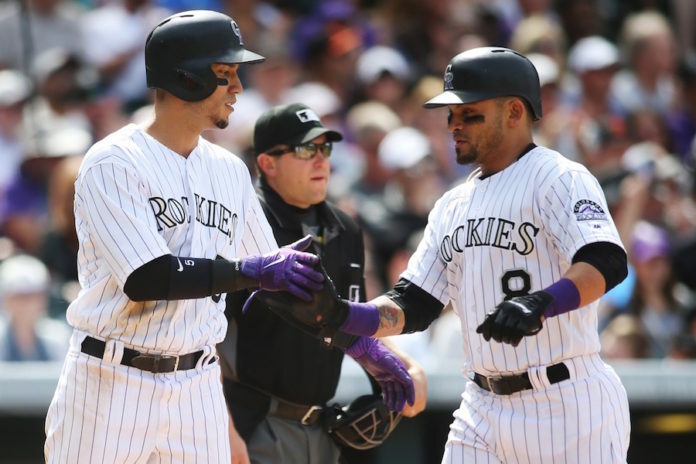 More importantly, some of Colorado’s struggling sluggers, namely Trevor Story and Carlos Gonzalez, started to find some rhythm. Gonzalez had a hit (of the infield variety), but reached base three times (two walks) and scored a pair of runs. Story posted his first multi-hit game of the year. Charlie Blackmon continued to heat up with a pair of hits and RBIs, and a run scored. The Rockies sent Bruce Bochy‘s bunch packing a battered, defeated bunch on all levels. In addition to losing ace Madison Bumgarner due to an off-field accident, they also saw Hunter Pence go down Friday night and miss a game with a leg injury. Then on Saturday Denard Span had to leave the game after crashing into the centerfield wall in the second inning; he did not play Sunday. A Giants writer even took a foul ball off the shoulder in the press box Saturday night. It’s been a while since the Rockies roughed up a meaningful division opponent like they did in this series. The win has Colorado at 13-6 on the season, the first team to 13 wins in the National League. Coincidentally, the team that can match them on Sunday night is the same team they’ll host for a four-game series beginning Monday. The Washington Nationals face the New York Mets on Sunday Night Baseball, then must travel all the way to Denver. That series shapes up well for the Rockies, despite not having Jon Gray in the rotation. The Nationals will likely be without ace Stephen Strasburg, who is out on paternity leave. Colorado’s starters will all be working on normal rest, as Chris Rusin is likely to get a spot start on Tuesday (Strasburg’s turn in the rotation). The Colorado Rockies sent a message to the National League West over the last week-plus. In nine games against the Giants and Dodgers, including six on the road, Colorado walked away with a 7-2 record. San Francisco was left licking it wounds, now with a 1-6 record against Colorado. And the Dodgers were left wondering how they could be 2-3 against the Rockies already this year. Now Colorado can send a message to the league as a whole, against Washington. The Nationals are one of the hottest teams in baseball to start the 2017 season, picking up right where they left off after winning the NL East two of the past three years. A series win against the Nats could lock up the best two-week stretch we’ve experienced following the Rockies in a very long while.